Below you will find information for adjusting three critical areas of your image: the brightness and contrast, the color, and the noise reduction (Moire pattern). Sometimes scanners scan a bit on the dark side or are a bit heavy on certain colors. When you scan from printed sources, a Moire pattern may appear. All of the above factors depend on which type of scanner and materials you use. In many cases, you will want to use your image as it is. 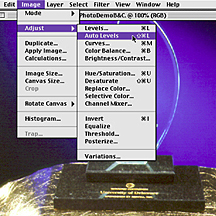 But, for those occasions when an adjustment is called for, then it's time for image manipulation software. We have found Photoshop to best suit our needs. Please Note: These changes should be made on your original image before the indexing/GIF procedure. 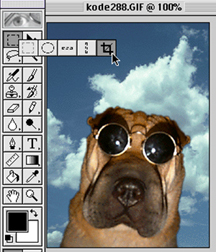 If the image has been converted into a GIF already, some of these options will not be available, and you will have already removed valuable information from the image. See GIF Tips for more information. 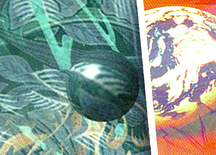 There are couple of ways to clean up the Moire pattern that often appears in your image when you scan from printed materials. The goal is to get rid of the pattern by blurring it out, without blurring the image too much. The first thing to try is a filter called Despeckle. It is a simple filter that looks at the overall image and smears the pixels around to smooth out the image. This filter is not always the best option. You have no control over the filter's application to your image, but it's the fastest method and worth a try. In many cases, it does the trick. Open file. Go to Filter menu. 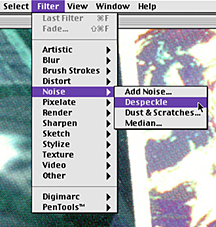 Drag down to Noise and over and down to Despeckle. In most cases, you will see the Moire disappear. In some cases, you may have to repeat the process. 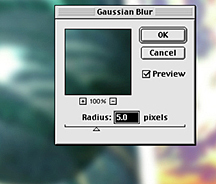 The Gaussian Blur filter offers settings for just how much to blur the image's pixels. The goal here is to get rid of the pattern and keep the image. Too much blur can make it appear as though you're viewing your image through a glass covered with vaseline. 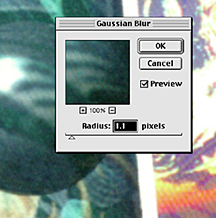 Drag down to Blur and over and down to Gaussian Blur. 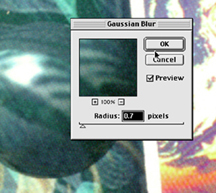 You will be presented with the controls window for the Gaussian Blur Filter. The control window appears with the last adjusment settings still active. In the case above, this setting would be too much and needs to be adjusted. The slider bar is moved to a number that will soften the Moire without obscuring much of the detail. Auto Levels is a quick way to adjust brightness, contrast and color-correct an image. It is often the first thing to try when adjusting an image. Although you may find that it does not always produce the best adjustments for every image. and down again to Auto Levels. This option offers no adjustment controls. 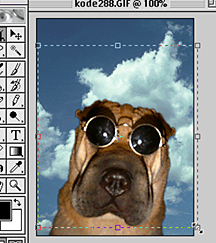 Photoshop will analyze your image and make the adjustments for you. This may be a good option, but if it is not, you have more controls by using the Levels option. Levels is another first-step option for image adjustment. 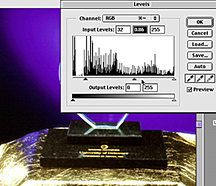 If Auto Levels is not right for your image, try Levels. 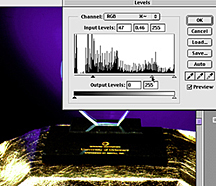 Levels gives you much more control over the adjustments. 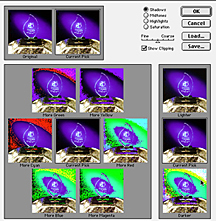 An example of when to use this option is when you encounter an image where the colors are so dark or light that many of the mid-tones are not there. over and down to Levels. You are presented with the Levels Control window. 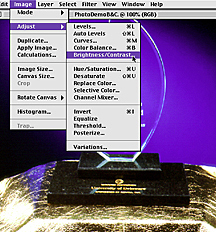 In the controls window, you will find a graph illustrating the dark, light, and mid-tone area of the image. Below the graph, you will see three triangle shaped sliders to control each area of the image. These controls allow you to add or subtract more light, dark, and mid-tones to your image. Be sure to check (so a check mark appears) the preview box so you will see the changes on your screen as you make adjustments. Notice how blotchy the background of this image is. Notice how the dark areas get filled in and turn darker. Notice how the light areas get brighter, but the gradation in the purple mid-tones of the background is less smooth. but can be adjusted independently (illustrated below). As you move the mid-tone slider to left into the dark areas, the mid-tones get lighter. The background gradation is becoming very coarse. As you move the mid-tone slider to the right you are adding more dark areas to the middle tones. In this case, removing the detail in the stone and very little gradation in the background. The objective is to create an image with areas that are not to dark or too light and too have detail in the mid-tone areas. This adjustment option is used for adjusting the overall image brightness and contrast. There are no controls for different areas of the image as there are in the Levels option. An example of when to use this option would be if the image overall tone is good, but it is a little dark and needs lightening. and down again to Brightness/Contrast. The Brightness/Contrast control window appears. You will see two slider bars for adjusting your image, one for brightness and one for contrast. Adding or reducing brightness/contrast is as easy as sliding the appropriate bar to the left or right of center. Be sure to check (so a check appears) the preview box so you will see the changes on your screen as you make adjustments. The goal is to brighten a dark image without destroying the contrast or to improve an image with little contrast. Sometimes when scanning, images will pick up a color cast or are a little on the dark or light side. 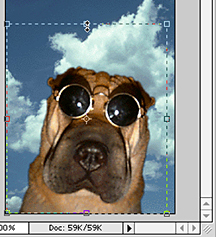 There is a quick and very visual way of adjusting these types of images in Photoshop. The Variations window appears and presents you with many options. In the window there are 12 small thumbnails of your image. They are displayed in a way that will reflect the options listed below it. For example: the "add more red" thumbnail looks more red, the blue option looks more blue, "lighten" is lighter and so on. Among these 12 images is a thumbnail of your original image which does not change, and a current pick thumbnail which displays all the changes you make to the image as you go. This is a nice feature because it enables you to compare your changes against the original. Adjustments are applied to the selected areas of the image by selecting the appropriate bullet. For example, you can change just the highlights or shadow colors by choosing that option. 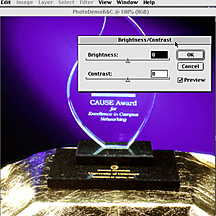 In this example, the highlights were selected. You can also lighten or darken these areas of the image by using the lighten or darken thumbnail. You can also make adjustments to the increments in which the changes occur by changing the Fine or "Coarse" adjustment. "Fine" makes smaller changes and "Coarse" makes larger more drastic changes. This adjustment works with all the settings available. 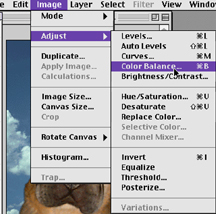 As you move these adjustment controls, Photoshop will show you where trouble spots will occur (by applying a bright color over that area of the image). This is called Clipping. Clipping is an area that is devoid of color, as in a white hotspot, or colors are unprintable, or there's too much black. Be sure to check the show clipping box. In this example, using the middle setting in the shadows shows us that there are many problems in the background of the image. We would not want to darken the shadows with the middle setting. After experimenting with the setting, we would probably choose to lighten the background shadows. 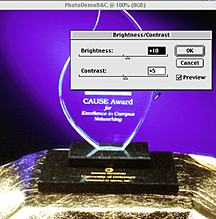 The color controls allow you another option for adjusting color in an image. The colors work together adding from one color and subtracting from the other. Another set of controls are located under Tone Balance controls box. 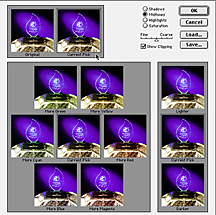 These controls allow you to select which area of the image the Color Balance controls effect, the shadow, mid-tones or highlights. In some cases you may only need to add or remove a color to or from the highlights. Some images need a lot more work, you may need to add or subtract color from all areas on the image. 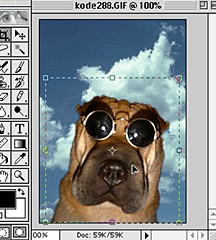 The cropping tool allows you to edit your image after you have scanned it. If it is not visible, look for it in the collapsible marquee tool icon. 1. 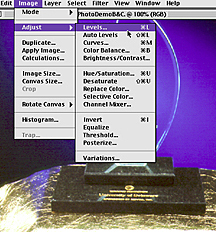 Select the cropping tool. 2. Click and drag the Cropping tool around the area to be cropped, enclosing the area you want to remain intact inside the selection. 3.The selection can be adjusted by pulling on the bounding box squares. When you are properly aligned over the bounding box adjustment square, your mouse icon will change to a double-headed arrow. These adjustment squares are located at the four corners and in the top middle and bottom of the selection. 4. When the selection is perfected, move your mouse somewhere inside the selected area, your mouse icon becomes a solid pointer. Once the solid pointer appears, double click your mouse. Your crop is set. The trick to using the Sharping tools is to use them in moderation. A little goes a long way. You want to make your image pop, not get sharpened away to high-contrast lines, creating a posterized effect. 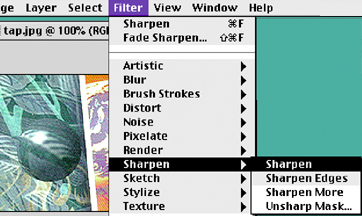 Photoshop offers you a couple of options in their sharpening tools. 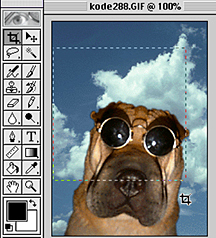 One option looks at the image and applies a filter to the entire image. 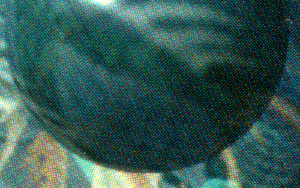 Another applies the effect to what it thinks are the edges of objects in the image. A more sophisticated filter called Unshape Mask, presents you with a controls window, giving you greater control over the filter's effects. Which filter you use will depend on the image you're working with. We'll start with the simplest options first. Sometimes an image will look fine, except for a little loss of detail or a little lose on the edges of similar colors . In this case, you may want to sharpen only the edges of the image. 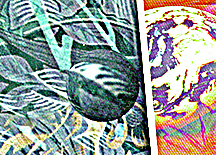 Photoshop supplies a filter for this called Sharpen Edges which looks at the over all image, decides where the edges are, and sharpens the contrast in those areas. 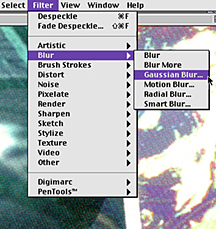 In the Filters menu, Drag down to Sharpen and over to Sharpen or Sharpen Edges. 1. Sharpen will look at the entire image and will sharpen it. 2. Sharpen Edges will do just that: look at the image, find the edges, and sharpen them. Scanners will often produce an image that is too soft. This causes the image to be little on the blurry side. In photographic terms this type of image is said to have an Unsharp Mask. 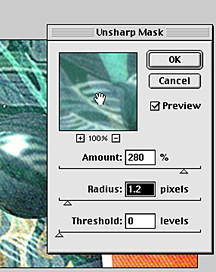 Rescaling or reducing an image can also create an image with an unsharp mask. Photoshop supplies a filter called Unsharp Mask which is used to sharpen an image with an unsharp mask. 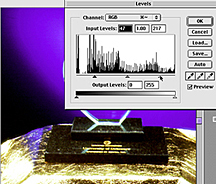 In essence the filter sharpens the entire image, but gives you greater control over the sharpening process. 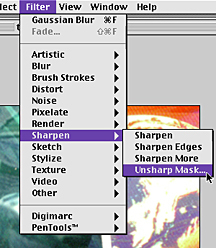 drag down to sharpen and over to Unsharp Mask. 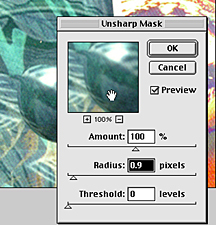 The Unsharp Mask control window appears. When the controls window appears, it will automatically apply the last setting used for the filter. This may or may not work with your image. In most cases, you will want to make adjusments. If you move, by clicking and holding the mouse down in the filters preview window, your mouse icon turns into a hand. 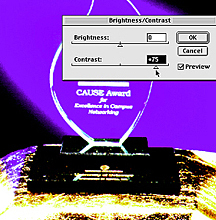 The preview effects of the filter return to its original blurry state. 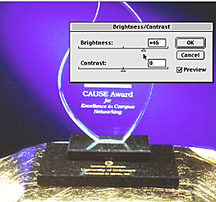 In this example, notice how the image in the preview window appears softer than the sharpened image below the controls window. This will help you to make the proper adjustments. Keep making the adjustment until the image is sharpened without any blaring highlights around the edges of the image. Threshold = the brightness and contrast of the effect.